A melee broke out following a tackle by Aberdeen's Dominic Ball on Hearts' Sean Clare. 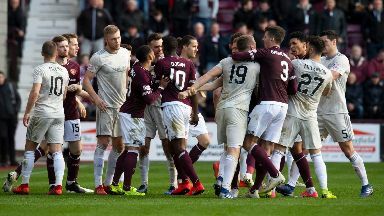 Hearts and Aberdeen have been charged by the SFA after an on-field confrontation during their Premiership meeting at the weekend. A number of players clashed after a tackle by Aberdeen defender Dominic Ball on Hearts midfielder Sean Clare. Four players were shown yellow cards following the melee, but both clubs have now been served with notices of complaint. They have been told to respond by Wednesday with a hearing scheduled for April 25. Hearts won the game 2-1 at Tynecastle.